After a few months in beta, Apple has today released iOS 9 to the world for everyone with an iPhone, iPad or iPod touch. Download the update from Settings on your iOS device, then tap ‘General’ and select ‘Software Update’. The required free space for installing iOS 9 is a lot lower than iOS 8, at around 1.3 GB, which should make it easier to upgrade your devices right away. Any device that runs iOS 8 can upgrade to iOS 9 and, naturally, iOS 9 will also ship preinstalled on Apple’s iPhone 6s and iPhone 6s Plus when they are released next week. Apple has updated the app switcher in iOS 9 with a new design but the same functionality. Instead of scrolling to the left to see older content, the multitasking app cards now flow right-to-left in order of most recently used. Each card is now always partially occluded by the surrounding apps, which is a change for the worse in comparison to iOS 8, but each card is also much larger than it was with the iOS 8 design. It was only introduced last year, but the Recent/Favorite Contacts bar has also been removed with iOS 9. However, there is a much-improved Handoff indicator now — it appears as a thin tab at the bottom of the screen. Simply pull upwards to open the suggested app and active Handoff. The new App Switcher may seem like an unnecessary cosmetic change, but it makes a lot more sense when seen in context. For instance, the iPhone 6s includes a 3D Touch gesture to smoothly pan between the cards which wouldn’t really fit with the old style. Moreover, it gels perfectly with the new metaphors introduced on iPad for side-by-side multitasking. Arguably the biggest new feature with iOS 9, Apple has added a whole new way to interact with multiple apps on iPad. Sort of like a traditional PC, you can now display two apps side by side on screen at the same time, what some would call ‘true multitasking’. There are three types of multitasking. On iPad Air or later, you can now swipe from the right edge of the display to open a skinny side window about the width of an iPhone. In here, you can open another app to view over the top of the primary app you are working on. The apps display just like tall-skinny iPhone apps and can do all the same functions as if it was full-screen. You can swipe it away and bring it back at any time — it will remember where you were. However, whilst the Slideover panel is active, you cannot interact with the full-screen app. This is where Split Screen mode comes in. Split Screen does exactly what you expect, let you fully interact with two apps at once. From a Slipover view, pull the tab at the left edge of the pane leftwards to expand the app into the full Split Screen Mode. Now both apps are displayed on screen at once. You can adjust the separation — either with a 66/33 or a 50/50 split. This is the definition of ‘real multitasking’ in the truest sense. You can dock your Twitter client to the skinny column whilst browsing Safari in the larger window. It’s also great for students and homework with a combination of a word-processor on one side (like Pages), to actually create the document, and Safari on the other side as the reference tool. There’s no drag and drop support between the two apps but the usual Copy-Paste dance works just fine. When you want to stop split-screen, just drag the divider all the way over to remove one of the apps. Due to the extra RAM and processing power this feature requires, it’s only available on iPad Air 2 and later, or iPad mini 4 and later. If you do have one of these newer devices, iOS 9 is worth it just for this feature. It greatly expands how useful the iPad is as a productivity tool. My personal favorite of the new iPad multitasking features is Picture-in-Picture. From any video app that supports the feature (which will be most, once developers submit their apps built against the iOS 9 SDK), press the Home Button. Rather than disappearing as it would with previous versions of iOS, the video stays around and pops out to become its own floating window. You can now navigate around other apps and the video keeps playing. The best part of this is it works with FaceTime video calling: you can do video conferencing on iPad whilst using an other app entirely. They can still see you, you can still see them. In particular, I think business will find a lot of use in this feature because you can now video chat and take notes using Pages (for example) at the same time. You can resize the PIP window with two fingers to scale it larger or smaller, as well as drag it around to change which corner it’s docked to. iOS does a decent job making sure it doesn’t get in your way automatically; it will move out the way of the system keyboard automatically for example. At any time, you can also flick the window off the side of the screen if you want to focus on something for a few minutes. Tap on the window itself to bring up controls to close the video or re-open the video in the originating app. Picture-In-Picture is supported by all iPads that support Slideover. iOS 9 has also given some iPad attention to the keyboard. Place two fingers on the system keyboard to turn it into a trackpad to control the text cursor. This enables you to quickly jump around and highlight sections of your document, without resorting to the other fiddly text selection tools iOS offers. Things like the magnifying loupe are more precise than using the trackpad but are frankly unnecessarily fine-grained for a lot of tasks – and the trackpad option is much more convenient. The trackpad feature will also be available on the iPhone 6s through a 3D-Touch gesture. iPads additionally get a new shortcut bar running along the top of the keyboard to access common text manipulation functions, like Cut, Copy and Paste. For all iOS devices, the Shift Key debacle has finally been resolved. Apple has changed the iconography to make it abundantly clear what state the Shift key is in, which will no doubt please a lot of people. With iOS 9, a filled in arrow indicates that the Shift key is enabled, versus an outlined glyph for the disabled state. By default, the iOS 9 keyboard will also show lowercase keys on the individual keyboard keys to reflect the Shift key state. Personally, I found this distracting and was glad to see you can disable the behaviour in Settings. iOS 9 brings with it an overhauled Notes app, with a greatly expanded feature set when compared to the simple plain text notes that existed before. You can now access font formatting options, add inline checklists and even draw sketches as part of your note. Links are also displayed with a thumbnail and textual preview, giving you much more context than the URL alone. Notes are synced over iCloud and its not backwards compatible. This means once you upgrade, Notes will no longer be kept up to date with other devices not running iOS 9. This also means that the Mac Notes app will be unable to sync with your phone and tablet until its updated to OS X El Capitan, which is set for release at the end of the month. You may want to hold off on upgrading to the new Notes until all your devices are on the latest versions of the operating system. iOS 9 introduces Low-Power Mode for the first time on iOS. Apple has done a lot of work under the hood with iOS 9 to get up to an extra hour of battery life in normal use, and Low-Power Mode extends that further. This power-saving feature switches off some of iOS’s more battery-sucking features, like certain visual effects, background app refresh and email refresh, to conserve as much power as possible. You can enable this feature from the Battery screen in the Settings app and it will automatically turn itself off once the iPhone is recharged. It’s meant to be used temporarily at times when you know you need to squeeze some extra battery longevity, like on a long trip. Combined with the more efficient software overall, Apple claims you can extend your battery life up to 3 hours longer on iOS 9. As part of this initiative, Apple has also updated the Battery views in Settings to give more details about what is going on with the phone. You can see battery usage data going back as much as seven days or just focus on the last 24 hours. Tapping on a details button will show how each app has been using battery in the foreground and background states. 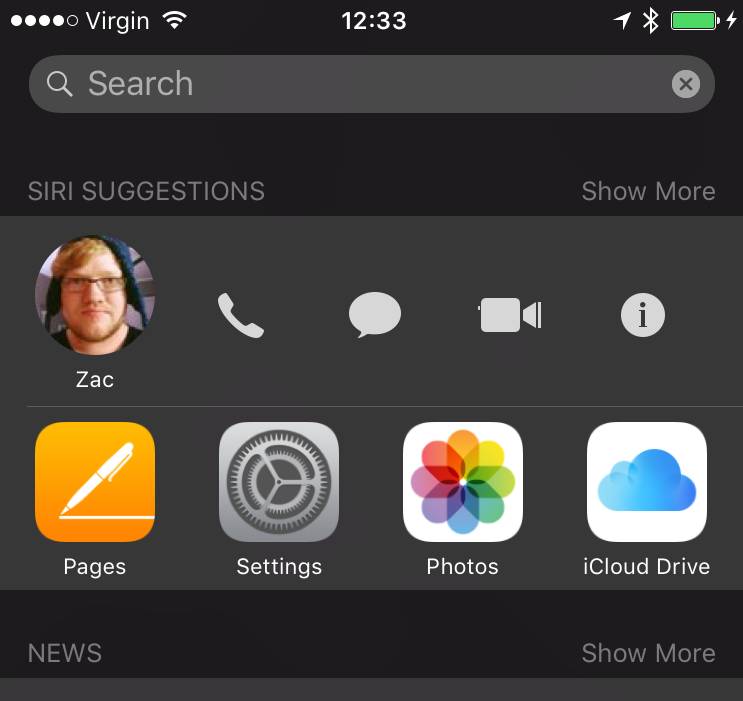 With iOS 9, Apple has moved the primary Spotlight Search view to the left of the first home screen, mirroring its placement in versions of iOS before the iOS 7 major redesign. Apple has also added a lot more functionality and features to Spotlight with iOS 9, although some are more useful than others. Spotlight can now answer many more types of questions natively, taking advantage of the expansive Siri database to populate information. Instead of talking, you just type what you want to know. You can see currency conversions, do simple math, lookup sports and much more just from Spotlight. Third-party apps can also integrate with the system to show their own search results in this list. For instance, you will be able to search for your own notes in Evernote or documents from the Microsoft Office apps (assuming they update to support the feature) from Spotlight. Without typing anything however, you will notice some other new listings in the Spotlight view. These are ‘proactive’ Siri suggestions where Apple tries to provide contextually relevant information automatically. Contacts that you talk to frequently, or are scheduled to talk to soon, will show up alongside apps that you commonly open in your daily routine. If you always check Twitter when you wake up, iOS 9 will start suggesting your Twitter app to you in this view in the mornings. There is also a separate listing for nearby points of interests, powered by Apple Maps, and top news stories. Unfortunately, a lot of these suggestions don’t feel very targeted or very relevant. It’s more like a random assortment of content that exists on your iOS device. Hopefully Apple will revise the algorithms powering this over time to make it better. You can also disable most of this stuff in iOS 9 settings if it annoys you. There are other Proactive parts of the operating system apart from Spotlight, however. These generally work a lot better and are genuinely helpful. Plugging in earphones will surface music apps on your lock screen to allow you to start listening to music instantly. It will also suggest podcast apps if that’s what you do most often. Similarly, when iOS 9 detects you getting in your car at the end of the day, it will popup an alert prompting directions to home with an ETA. This just removes friction and the frustration of having to dig around the Maps navigation options, just to go home. iOS 9 Calendar can also warn you about potential traffic problems with events you had scheduled for a certain time. Mail will additionally automatically populate your calendar with data it gathers from incoming emails, such as those referencing an upcoming meeting. They appear as a different color in your Calendar and can be optionally disabled. You won’t notice some of this stuff right away when you upgrade — iOS 9 has to learn your habits and preferences over time to deliver relevant suggestions. In general, a lot of small niceties add up to a significant change in your enjoyment of the operating system. Maps has finally added transit and public transport directions with iOS 9. From the map, tap on a bus stop or train station to see upcoming departures from that place. You can also directly ask for directions via transit, rather than simply walking or driving. The attention to detail is important here. Apple has custom map icons and assets for every location so the symbols seen in the Maps app directly line up with what’s shown in the real world. For instance, in London the Maps app color codes the Underground lines to match how they are represented on real Tube maps. As well as mapping the building of train stations, Apple Maps even shows you the accurate location of pedestrian entrances into the station platform. You can even enable a Transit map view that focuses only on transit points of interest, which means it’s easier to work out where you need to go if you aren’t interested in the road network. The cartography is really pretty. iOS 9 Transit is rolling out to more cities over time: right now it’s available in Baltimore, Chicago, China, London, Mexico City, New York City, San Francisco, Toronto and Washington. iOS 9 adds a native iCloud Drive app so there’s finally one place you can go to see all your documents that sit in the iCloud. It’s pretty barebones, with two views of your hierarchy; icon or list view. You can tap through your folders and preview all the files as well as share files with others, or open the file in an app for editing. As long as developers support the feature, iOS 9 also allows users to edit a document in multiple apps but only ever have one copy of the file stored in iCloud Drive. With iOS 8 and before, apps had to create their own copies of files leaving a lot of duplicates spattered on your cloud space. iOS 9 includes the new behaviour which acts closer to how OS X manages files shared between multiple apps. As a user, you don’t have to do anything special — just use the app as normal and it will take advantage of the feature if it is supported. Passbook has a new name and a new icon in iOS 9: it’s now called Wallet. Despite the branding change, the app itself is identical in function, with your Apple Pay bank cards and passes displayed in a stack. However, iOS 9 does add support for loyalty cards so you’ll be able to start adding reward cards to your Wallet and they’ll show up here too. iOS 9 also adds Apple Pay support for Discover cards and Discover is offering a 10 % cashback deal in coordination with iOS 9’s launch on Apple Pay purchases. With iOS 9, Newsstand has been removed from the system — all news apps are now treated the same on your home screen. However, Apple has a new News app of its own that comes preinstalled with iOS 9. It’s sort of like a pretty RSS reader. You can subscribe to stories from a wide variety of publications, including 9to5Mac, and they are formatted for an optimized reading experience. The closest thing to compare it to is Flipboard. Some news publication will publish content using Apple’s new document format (the ‘Apple News Format’) for a richer display of text and media. For unknown reasons, the News app is not available in all countries as of today. It’s launching in the United States with support for the United Kingdom coming in iOS 9.1. Apple will roll out more countries over time. … And that’s about it for the major new user features in iOS 9. As with every version of iOS, there are a wide variety of minor changes throughout the system that will improve your daily life with an iOS device in addition to the new stuff mentioned above. In general, iOS 9 is on the smaller side of major iOS updates — much of this year’s engineering work on Apple’s side went into behind-the-scenes improvements for performance and stability changes. There’s still a lot here though and there’s no real reason not to update; the improvements for iPad especially are too good to miss out on. Naturally, iOS 9 also includes support for the new features in iPhone 6s (like 3D-Touch and Live Photos) and we’ll give you a full hands-on with that when the new iPhones are released on September 25th. For now, download iOS 9 and tell us what you think about Apple’s latest iteration of its mobile operating system in the comments.